Emily Enough: Imprisoned is the touching story of a misguided but brilliant child heiress turned murderer, and her descent into the corporate underbelly of a New York State asylum. A very sick, twisted, and hilarious game! Get it or regret it! loved it! Emily is a great main character to play throughout a very cleverly setup story. My only complaint is about the puzzles. While they are good in theory and actually not to hard, sometimes it's quite complicated to get there (like you have to talk to someone again right after you had a talk with them). Charming characters and humor, a bit light puzzle and story wise. The game goes along the sharp edge between farce and sickness, and that what I found most amazing. Promotes strongly deviant behaviours, both for adults and children. I finished the game because i thought the goal of the game was to condemn them, and/or show how they are awfull, but was not. Sould be on a page for adults only, or even just removed. Amazing game! I fell instantly in love with Emily: how could you not love an adorable psychopath with a pink dress?! Great sense of humour, I will never look at Ed Gein quite the same way... Nor meetings to discuss the overall enjoyment of a knife while killing... Outstanding! I hope there's a sequel soon... Please...? Awesome Game..its my absolute favourite on here. Id love to see a sequel too! People who havent played this yet: Great graphics, awesome evil main character...just play it or youll miss out. Please, PLEASE make a sequel. This game is awesome. I just finished the game. I LOVED the script! LOVED IT! It's the best I have seen so far! The things Emily says throughout the game were awesome! Great sense of humour, great story and plot, nice graphics. The only part I didn't like was the music. But apart from that I really enjoyed this game very much. I hope Emily kills Percy or the heir of her family fortune or something, because I really want to play an other episode! Great work! the end sequence/puzzle was a bit rushed and silly, but overall this is a damn good game. and the title track was awesome - that alone was worth the download. please bring back Emily in a new game! Wonderfully grim and black adventure! Thank you! I really enjoyed the general feeling. Graphics are outstanding. Maybe I expected a little more about different characters, but it didn't bug me much after all. Story is everything but ordinary and the puzzles seemed to suit the game very well. Congrats! This is my favourite AGS game by far. Great characters, humour, graphics, music and dialog. I have just finished playing this game. Overall I would rate this very highly. A few difficult sequences but nothing too crazy making. Only complaint would be the length. More please! 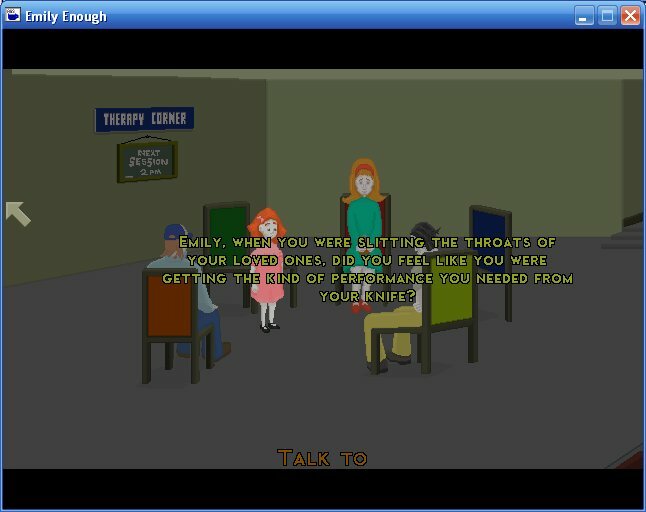 Emily Enough is a sometimes deliciously off colour adventure. Set in an asylum, you play the role of spoiled brat murderer Emily, hell bent on escape. The main attractions of Emily Enough are the graphics and the music. The pale, eerie characters stare blankly a the walls of the superbly sterile asylum and the cold, detached music really lends the game a stomach churningly creepiness. The script is good but flawed. Insistantly sick, it dwells on the dark side of the human soul, making room for some great satire on big business. Some of the characters seem a little redundant and occasionally the desire to be gruesome overwhelms the comic potential. I adore black comedy but it can be hard to pull off. The therapy session stands out from the script (Ed and his obsession with killing whores made me laugh most). With a decent game length and some pretty difficult puzzles, you should be playing Emily Enough for a while. It's a good first effort which conquers its flaws and emerges as a solid if slightly uneven gaming experience. Ewwww gruesome LOL Great game with some really good puzzles. Definitiely one to put on your 'must play' list!